Join exhibiting artist, Drew Brophy, for a workshop inspired by his exhibition, Making Waves | A Drew Brophy Retrospective. 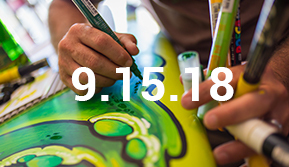 Students will work with Brophy and learn techniques using the water-based, Uni Posca pen that Brophy uses in his famous surf-art works. Space is limited, reservations are required. Ages 16 and up. Please call the Art Museum at 843.238.2510 for all reservations. $50 | per person | Ages 16 and up.